After drawing a lot of attention for a comedy routine on “The Manzai 2017,” a nationally televised comedy program on Fuji Television, that featured jokes and a satirization of base construction in Okinawa in places such as Henoko in Nago City and in Takae in Higashimura, Daisuke Muramoto from the comedic duo “Woman Rush Hour” held a press even for Okinawan news agencies while on tour in Naha. 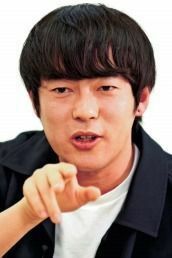 Muramoto came up with the idea to write jokes about the base issue after an exchange with journalist Jun Hori while appearing on his internet video series. Based on the advice of Hori, Muramoto debuted his first joke about the bases around one year ago while performing at a theater in Naha, which was met with thunderous applause. He promised to tell the joke on-air to a national audience, and later that year delivered. This time, when visiting Okinawa for the live performances, Muramoto visited Henoko the evening of January 1, and listened to the thoughts of Okinawans engaged in a sit-in opposing the base construction over drinks. As for the online abuse towards the anti-base movement, Muramoto stresses, “There is something to [Okinawa’s] actions. Have a drink and a conversation with them.